Rules: Every row and column should contain four arrows, pointing at four main directions. Clues in the grid represent the number of arrows contained in a chain that starts from that cell and leaves the grid at the grid edge, following a route guided by first encountered arrows along the way. Background: I’ve been checking JPC files time to time. Because there could be a chance to figure out some puzzles which I couldn’t understand before. So, this type is a JPC puzzle. I’m not sure when I did understand the rules. Probably, in one of my attempts I had solved the example, and got the rules. Here is the original page for Signage, in 15th JPC, 2006. I made a few Signage puzzles. First one was for Akil Oyunlari magazine, issue 68. I published it as an instructionless puzzle (“Açıklamasız” in Turkish) in issue 68, page 37. I think I forgot the puzzle for a while. Then, when I was searching all Akil Oyunlari magazine issue to decide puzzle types for akil oyunlari magazine competition in LMI, I met this type again. I prepared one more time. 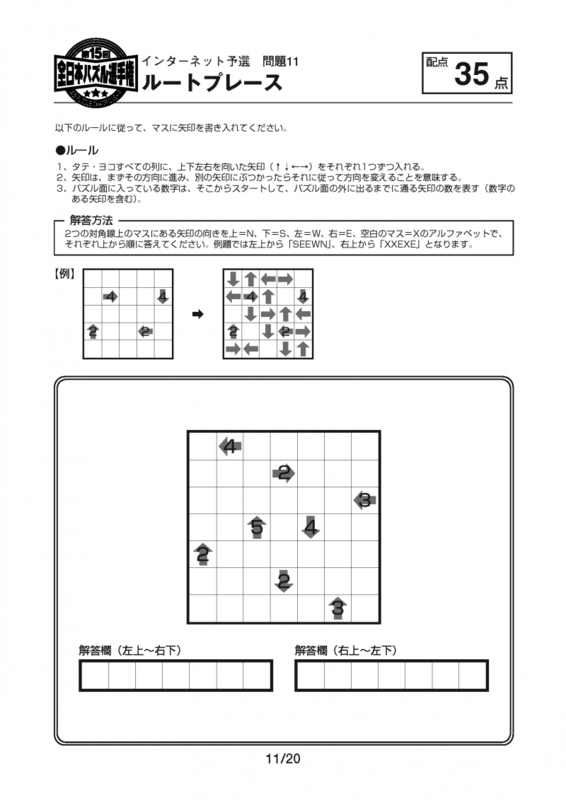 During the competition Bram pointed that Signage is one of Naoki Inaba puzzle type, and he shared the link in LMI forum. I didn’t know that. Naoki named this puzzle as Route Place. If I did know before, certainly I would have used and published by the same name. Because as a puzzle designer, I know the code: “Respect designer’s thoughts!”. So I’m sorry for this. Bu yazı Instructions içinde yayınlandı ve Akil Oyunlari, JPC, LMI, Naoki Inaba, puzzle, Route Place olarak etiketlendi. Kalıcı bağlantıyı yer imlerinize ekleyin. Routep may have came from Route Place, the original name from JPC.